Fredrik Gulbrandsen, in his first career start at home for the Red Bulls, tallied a game-high six shots with one shot on target in 75 minutes of playing time at forward. These teams are not natural rivals, but it had the feel of a rivalry match, as there were six red cards in this one, five for Real Salt Lake and one on the Red Bulls. It was just the third time in 72 MLS regular season matches under head coach Jesse Marsch that the Red Bulls ended a game in a 0-0 draw. 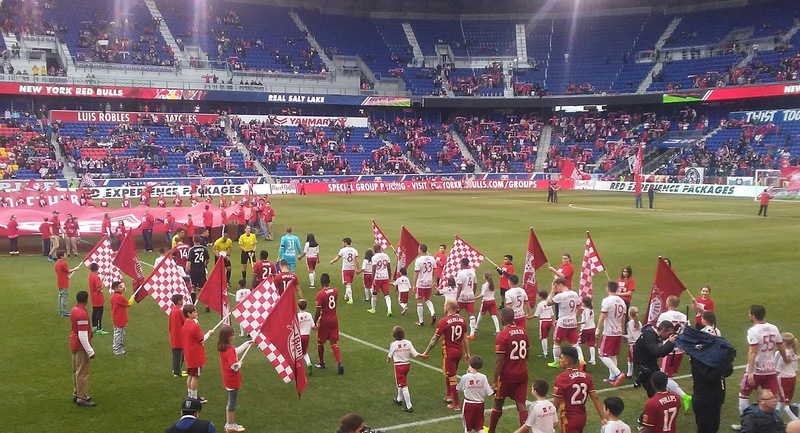 Following the draw, the Red Bulls have clinched a full calendar year without dropping at match at Red Bull Arena during the MLS regular season. New York's last loss at home came against Sporting Kansas City, 2-0, on April 9, 2016. With Sacha Kljestan on national team duty, Luis Robles wore the captain's armband. Robles recorded his second shutout this season and 41st of his career, denying all four shot attempts. He is the franchise's all-time leader in shutouts. Marsch said of Kljestan's absence possibly making it challenging for his offense, "Well, I mean, listen, Sacha's a huge player for us in terms of creating chances, but we had plenty of chances. We had plenty of chances. Like I said last year, we're going to come together, we're going to score goals. It's taking a little bit of time, but we all know what we have here and that it's going to come together. "So, I could go back and say that again. Listen, it would have been nice to get a win tonight and three points because it continues to give us time to feel good, and feel positive energy with everything coming together, and knowing that it will come around eventually. We didn't manage to do that, but I still feel like there's a lot of good performances on the day. "I feel like Connor Lade came in and for 60 minutes was pretty much our best player. Played very well. I thought Aaron Long played really well. Kemar Lawrence comes back and does fairly well. Tyler Adams, thought Tyler Adams was very good, and Felipe's been very good all year. "So there are still plenty of positives to take away from it. It's just you feel like you let two points slip away." Connor Lade made his first appearance of the season, starting at right back. Lade suffered a season-ending ACL injury last August. Tyler Adams made his first start of the season. The 18-year-old missed time during preseason while with the U.S. Under-20 Men's National Team that won the CONCACAF U-20 Championship. Adams, who had one career start with 45 minutes of playing time before today, played a full 90 minutes in the midfield. Adams had perhaps the play of the game made a crucial defensive save of a Yura Movsisyan shot along the goal line in the eighth minute, after Sebastian Saucedo hit the post. Marsch said of Adams, "Tyler is tenacious in there. He's aggressive. He's confident on the ball. He's still, I think, that's the thing that he's still developing is the savviness and sense of how to move around with the game and set plays up in front of him. But I thought overall that was pretty good tonight. He wins his duels. He's fast in there, he covers ground, he pressures well, he breaks up plays, and he's a competitor. So, I mean, I could go on because we think so highly of him, and know that it's only a matter of him getting repetition for him to continue to elevate his status within the team and continue to develop as a player." Marsch said of this draw with a weak Salt Lake team feeling more like a loss, "Well, I mean, I don't want to reference Salt Lake, but I'll say anytime we don't get three points at home, we're disappointed, because we've been a very good team here at home for quite some time now. We like to put on a show for our fans. We like to be very aggressive at home and get our points. So that part is always a disappointment. The guys walked off the field like it was a loss, and I kind of had to remind them in the locker room like, come on, man, it's the beginning of the year. We've got things to work on. But there are a lot of positives from that performance that we can build on and continue to move forward. "One of the things I'm challenging them is that we look like two different teams in the first half and the second half, right? So sometimes at halftime when they come in, I'm trying to encourage them to get themselves going, and it's almost like from the first whistle in the second half they show more confidence, they show more urgency, they show more belief, and they come out and look more like us. "I feel like if we've had six games where we've played so far, if we would have played in the first half like we played in the second half in each one of those games, we'd have six positive results along the way. So, you know, we're a new team here. We've got some younger guys on the field. We're encouraging them to keep themselves going. But I promise you, this team will get better as the year goes on." With the tie, the Red Bulls move into sole possession of first place in the Eastern Conference with seven points (2-1-1) through four matches played. 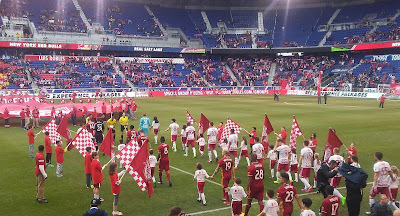 The Red Bulls head out for two-straight on the road, with trips to Houston (April 1) and Orlando (April 9) before returning to Red Bull Arena on Saturday, April 15 to host D.C. United. The Red Bulls were one of just six teams in the MLS to play this weekend, which is filled with international games. Marsch said of this, "I don't like it. I don't understand it. These are things for you two ask the league. There's often things that I don't quite get. But in the end, it's okay because it gives us a rhythm right now of playing games, but, yeah, I'd much rather have both teams be able to have their full complement of players."